Mac and cheese to me is a staple of comfort food. I haven’t made homemade mac and cheese in a while, so I wanted to give it a try with one of my favorite brands of cheese and butter Kerrygold. I used Kerrygold aged cheddar and creamy dubliner cheese wedges. For the base of the sauce I used the unsalted Kerrygold butter. This is perfect for this weekend’s festivities of Labor Day. Your guests or host will not be disappointed. Bring a large pot of water to a boil. Add salt. Add the pasta and cook for 10 to 11 minutes, until al dente. Drain well. Set aside. Next melt butter in a large saucepan and whisk in the flour. Cook for 2 minutes over low heat, stirring constantly with a whisk. Slowly whisk in the hot milk and cream. Cook for 2 minutes, whisking constantly, until the white sauce is thickened and creamy. Now take off of the heat, add the Aged Cheddar and dubliner wedges, salt,pepper to taste and nutmeg. Take the cheese sauce and pour over drained and cooked pasta. Stir until everything is well incorporated. 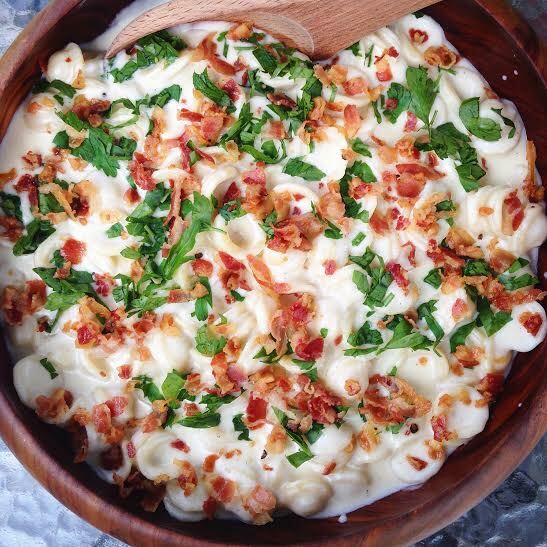 Top with pancetta and parsley. Mouth is watering – this looks fantastic! Saving for a chilly night this fall/winter! This just looks like a big bowl of delightful indulgence. Love the choice of pasta for this dish too!